The efficient introduction of fluorine moieties into molecules has been at the forefront of research in the past few years. 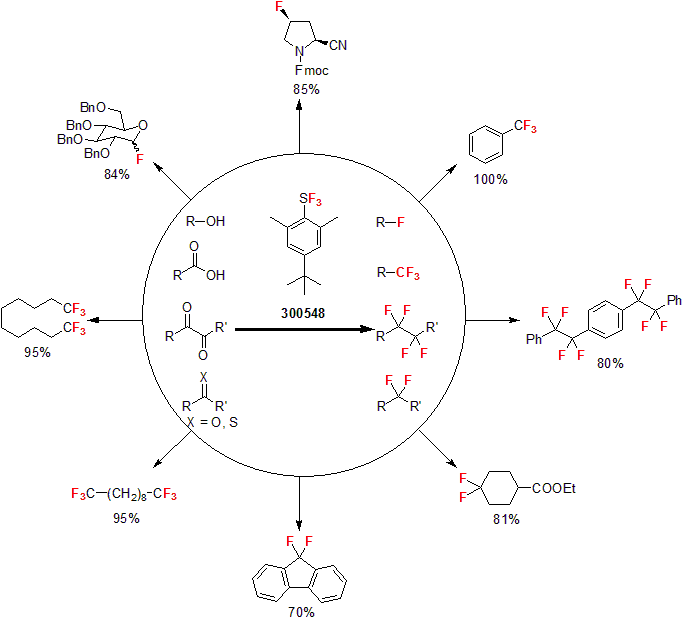 Extensive studies on the effect of fluorine atom on a molecule have shown enhanced biological activity, metabolic stability, binding interaction, and other favorable changes in physical properties of target compounds. 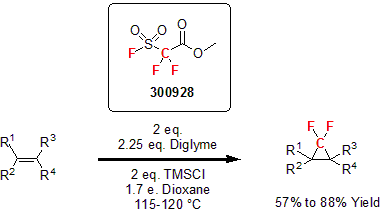 However, the addition of fluorine to a molecule often requires harsh conditions and do not tolerate many functional groups. 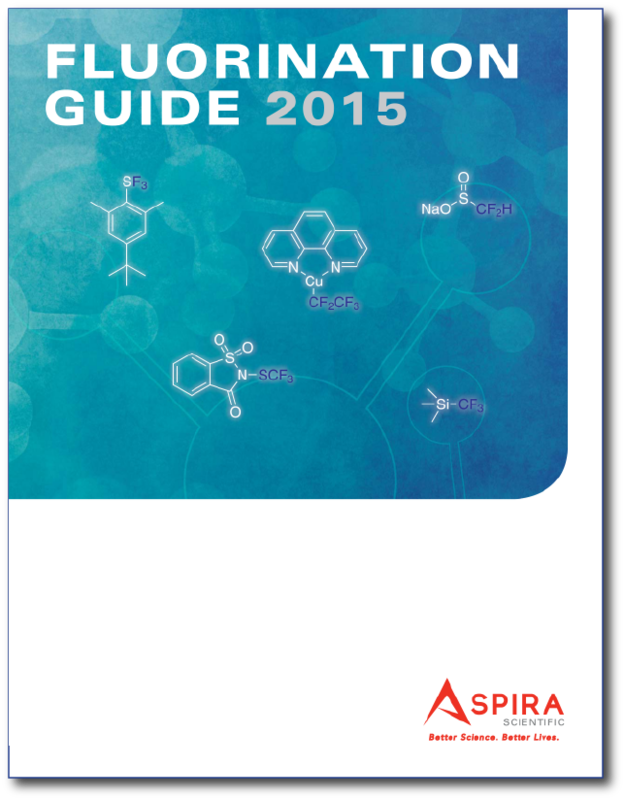 Working with world-class experts in fluorination chemistry, Aspira Scientific is pleased to offer single access to state-of-the art technologies, novel synthetic tools, and IP-enabling templates for drug discovery, crop protection, and material science. 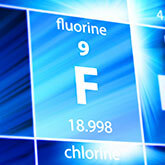 From gram-quantity catalog products to kilogram-and-beyond custom solutions, we bring the power of "fluorine" to your programs. For custom solution inquiry, please contact collaborate@aspirasci.com. Since 1978, Umemoto has been one of the pioneers in fluorine chemistry and contributed significantly to the expansion of the field, with the development of various popular fluorinating reagents that are used to this day. 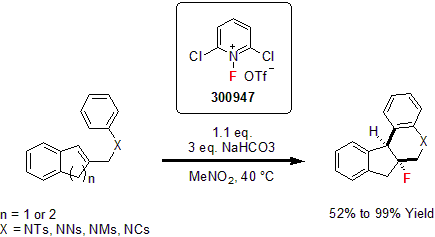 In 2010, Umemoto reported an air-stable alternative to common fluorinating agents such as DAST for the conversion of hydroxyl and carbonyl groups named Fluolead™.1 This reagent has proved to be very versatile reacting with a variety of hydroxyl and carbonyl groups yielding the corresponding fluorinated products in good to high yields. Fluolead™, a white to off-white crystalline material, also showed high thermal stability and high resistance to aqueous hydrolysis. Extensive studies have been conducted using DSC and ARC to evaluate the thermal stability of Fluolead™. These studies conclusively show the highest thermal stability of Fluolead™ compared to DAST and Deoxo-fluor™. In particular, it showed that Fluolead™ has an excellent thermal stability above 150 °C, which makes it the most stable deoxofluorination reagent to date. It gives Fluolead™ the ability to be used in reactions requiring temperatures in excess of 100 °C, commonly used for the conversion of carboxylic acids to trifluoromethyl groups. More importantly, these results illustrate the suitability of Fluolead™ for deoxofluorination reactions on commercial scales. 1 Umemoto, T. et al. J. Am. Chem. Soc. 2010, 132, 18199. 1 Forche, D. In Methoden der Organischen Chemie Houben-Weyl; Mueller, E., Ed. ; George Thieme Verlag: Stuttgart, 1962; Vol. 5/3. 2 (a) Liotta, C. L.; Harris, H. P. J. Am. Chem. Soc. 1974, 96, 2250-2252. (b) Colonna, S. et al. J. Chem. Soc., Perkin Trans.1 1979, 2248-2252. 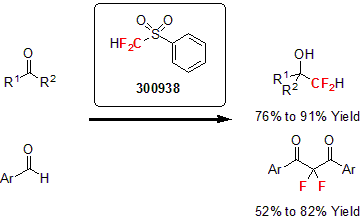 (c) Ishikawa, N. et al. Chem. Lett. 1981, 761-764. 3 Kim, D. W. et al. J. Am. Chem. Soc. 2002, 124, 10278. 1 (a) Taylor, S. D. et al. Tetrahedron 1999, 55, 12431. (b) Bailey, W. H., III et al. Chem. Commun. 2002, 67, 1416. 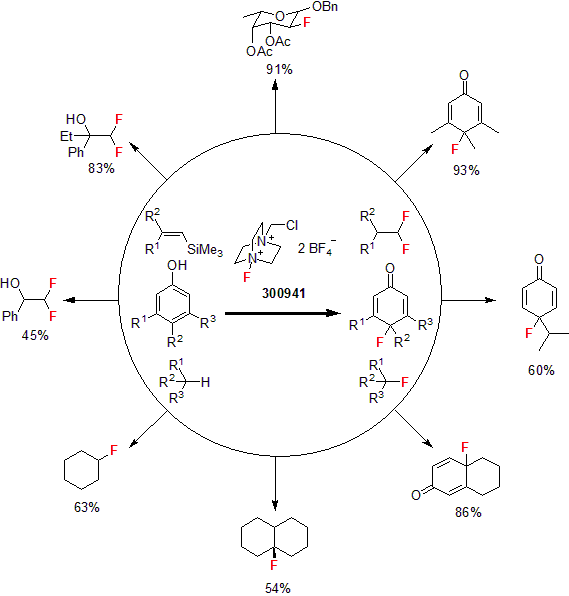 (c) Patrick, T. B. Electrophilic Fluorination of Carbon Hydrogen Bonds. 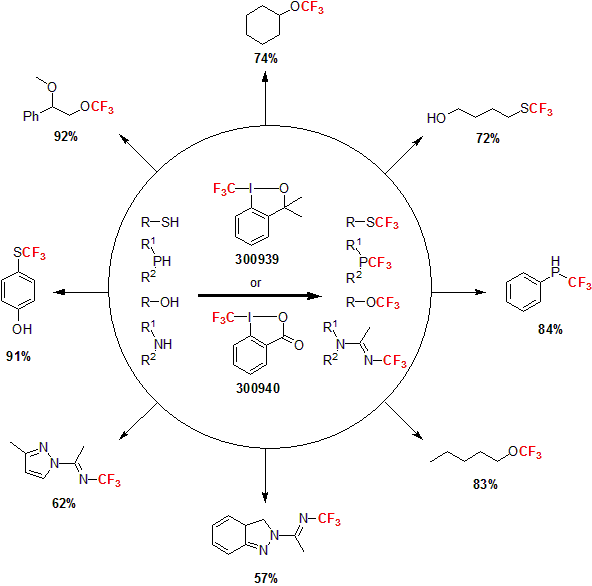 In Chemistry of Organic Fluorine Compounds II: A Critical Review; Hudlicky, M., Pavlath, A. E., Eds. ; ACS Monograph 187; American Chemical Society: Washington, DC, 1995; pp 133-171. (d) Rozen, S. et al. Chem. Rev. 1996, 96, 1717. 2 (a) Singh, S. et al. J. Am. Chem. Soc. 1987, 109, 7194. (b) Resnati, G. et al. J. Org. Chem. 1991, 56, 4925. 3 (a) Banks, R. E. J. Fluorine Chem. 1998, 87, 1. (b) Lal, G. S. et al. Chem. Rev. 1996, 96, 1737. (c) Furin, G. G. et al. Russ. Chem. Rev. 1999, 68, 653. 4 Shreeve, J. M. et al. Acc. Chem. Res. 2004, 37, 31. 5 Talbot, E. P. A. et al. J. Am. Chem. Soc. 2014, 136, 4104. 1 Umemoto, T. et al. Tetrahedron Lett. 1986, 27,4465. (b) Umemoto, T. et al. Bull. Chem. Soc. Jpn. 1986, 59, 3625. 2 Umemoto, T. et al. J. Am. Chem. Soc. 1990, 112, 8563. 3 Wolstenhulme, J. R. et al. Angew. Chem. Int. Ed. 2013, 52, 9796. 1 Differding, E. et al. Synlett 1991, 187. 2 Chen, C. et al. J. Org. Chem. 2014, 80, 942. 1	Morimoto, H. et al. Angew. Chem. Int. Ed. 2011, 50, 3793. 2	Mormino, M. G. et al. Org. Lett. 2014, 16, 1744. 1 (a) Litvinas, N. et al. Angew. Chem. Int. Ed. 2012, 51, 536. (b) Mormino, M. G. et al. Org. Lett. 2014, 16, 1744. 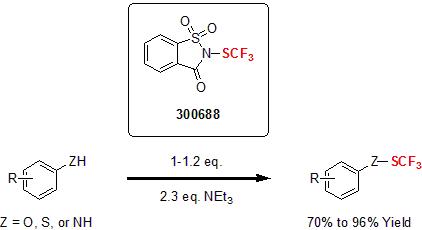 The pioneering work of Ruppert and Prakash which yielded the Ruppert-Prakash reagent (TMSCF3) was one of the first and most versatile ways to introduce a CF3 moiety by nucleophilic activation.1 In 2006, Prakash and his group reported the synthesis of TMS-protected trifluoromethylated alcohols using TMSCF3.2 Using trimethylamine N-oxide as the catalyst in tandem with TMSCF3 in DMF, the researchers highlighted the versatility of the synthetic method by reacting a variety of substituted aryl aldehydes and ketones. This method proved to be fast and insensitive to moisture for a variety of phosphates and carbonates yielding the corresponding TMS-protected alcohols in good to excellent yields. 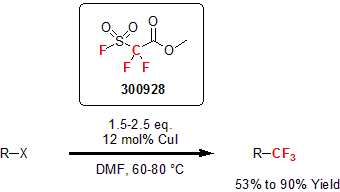 More recently, Buchwald and co-workers utilized several silicon-based CF3 reagents for the trifluoromethylation of various vinyl triflates and nonaflates.3 Using 8 to 12 mol% of palladium (II) complexes with tBuXPhos, 2 equivalents of TMSCF3 or TESCF3 with KF as an activator, a variety of vinyl triflates were trifluoromethylated in good to excellent yields. 1 (a) Ruppert, I. et al. Tetrahedron Lett. 1984, 24, 2195. (b) Prakash, G. K. S. et al. J. Am. Chem. Soc. 1989, 111, 393. (c) Prakash, G. K. S. et al. Chem. Rev. 1997, 97, 757. 2 Prakash, G. K. S. et al. J. Org. Chem. 2006, 71, 6806. 3 Cho, E. J. et al. Org. Lett. 2011, 13, 6552. 1 Eisenberg, P. et al. Chem. Eur. J. 2006, 12, 2579. 2 Charpentier, J. et al. Chem. Rev. 2015, 115, 650. 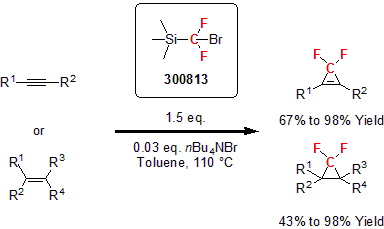 In 1991, Langlois and co-workers were able to generate a trifluoromethane radical under oxidative conditions using sodium trifluoromethanesulfinate as a precursor.1 For the next 20 years, this reagent was infrequently used with mixed successes. 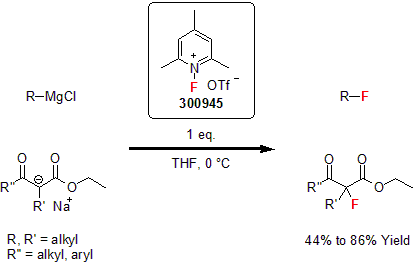 It was not until 2011, when Phil Baran and his group successfully used the Langlois reagent in the C-H trifluoromethylation of N-heterocyclic compounds that broadened its applicability and increased its usage in literature.2 This metal-free reaction can be applied to unprotected molecules with limited side reactions. 1 Clavel, J.-L. et al. Phosphorus, Sulfur, Silicon Relat. Elem. 1991, 59, 169. 2 (a) Ji, Y. et al. Proc. Natl. Acad. Sci. U.S.A. 2011, 108, 14411. (b) Musumeci, D. et al. Chem. Commun. 2013, 4, 1405. 3 (a) Cao, X.-H. et al. Chem. Commun. 2014, 50, 3359. (b) Yang, Y.-D. et al. Chem. Commun. 2013, 49, 5510. (c) Li, Y. et al. Chem. Commun. 2013, 49, 2628. (d) Jiang, X.-Y. et al. Angew. Chem., Int. Ed. 2013, 52, 14177. (e) Deb, A. et al. Angew. Chem., Int. Ed. 2013, 52, 9747. (f) Cui, L. et al. Adv. Synth. Catal. 2013, 355, 2203. 4 He, Z. et al. Org. Lett. 2015, ASAP. 1 Chen, Q.-Y. et al. Chem. Commun. 1989, 705. 2 Eusterwiemann, S. et al. J. Org. Chem. 2012, 77, 5461. 3 Chen, Q.-Y. et al. J. Fluorine Chem. 1989, 44, 433. 1 Ambler, B. R. et al. Org. Lett. 2013, 15, 5578. 2 Qiao, Y. et al. J. Org. Chem. 2014, 79, 7122. 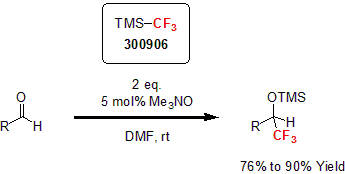 In 2011, Hu and his group developed an efficient difluoromethylation of carbonyl compounds and imines.1 In this report, they used TMSCF2H as a nucleophile activated by a Lewis base at room temperature. 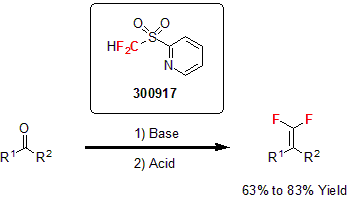 This procedure proved to be successful with a variety of ketones, aldehydes, and imines with high yields of the corresponding fluorinated product. 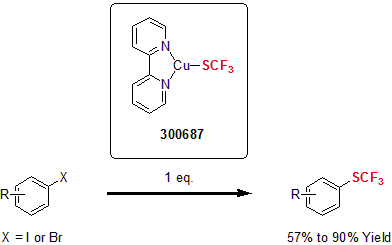 Using TMSCF2H in 2012, Hartwig and his group developed a copper-mediated difluoromethylation of aryl and vinyl iodides.2 They showed the versatility of this reaction by reacting electron-neutral, electron-rich, and sterically hindered aryl and vinyl iodides with CuI, CsF, and TMSCF2H to yield the difluoronated product in high yields. 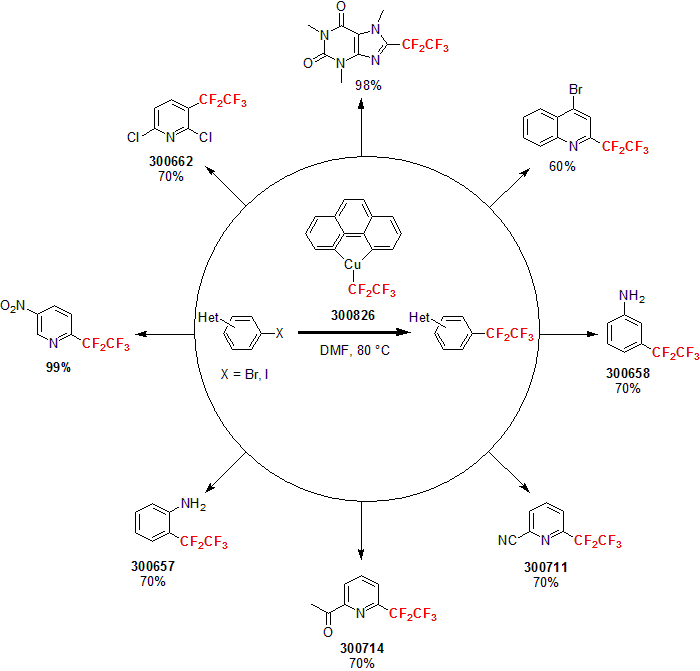 In addition, the reaction tolerates a wide variety of functionalities such as amines, ethers, amides, and esters. In a typical reaction, 1 equivalent of CuI, 3 equivalents of CsF and 5 equivalents of TMSCF2H are combined with the substrate in NMP at 120 °C for 24 hours. 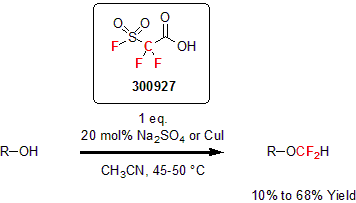 Hu and his group developed another fluorination reagent for the difluoromethlyation of heteroatom nucleophiles and the difluoromethylenation of alkenes and alkynes.3 This new reagent proved to be a safer alternative to TMSCF2H since no gaseous by-product is generated. 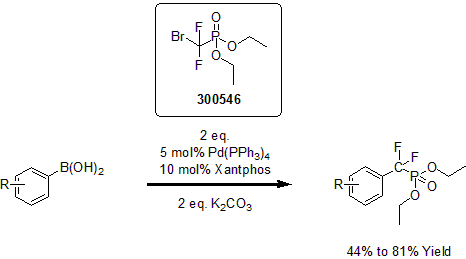 The reagent underwent addition with various alkynes and alkenes, affording difluoromethyl-containing cyclopropenes and cyclopropanes, respectively. 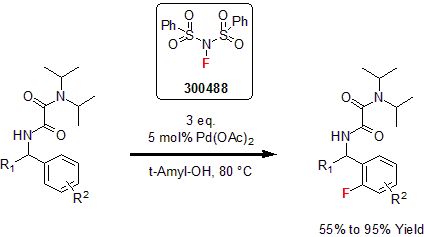 In addition, the reagent reacted with O, S, and N nucleophiles exhibiting good tolerance of different functionalities. 1	Zhao, Y. et al. Org. Lett. 2011, 13, 5342. 2	Fier, P. S. et al. J. Am. Chem. Soc. 2012, 134, 5524. 3	Li, L. et al. Angew. Chem. Int. Ed. 2013, 52, 12390. 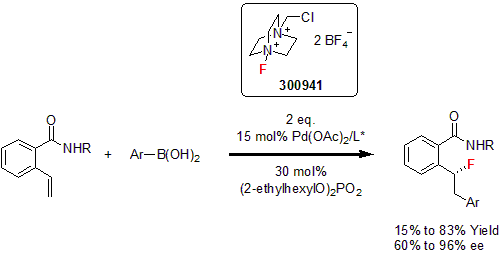 The Xingang Zhang group recently developed an efficient method for difluoroalkylation via palladium catalysis.1 This method features several advantages including broad substrate scope, excellent functional group compatibility, and synthetic simplicity. 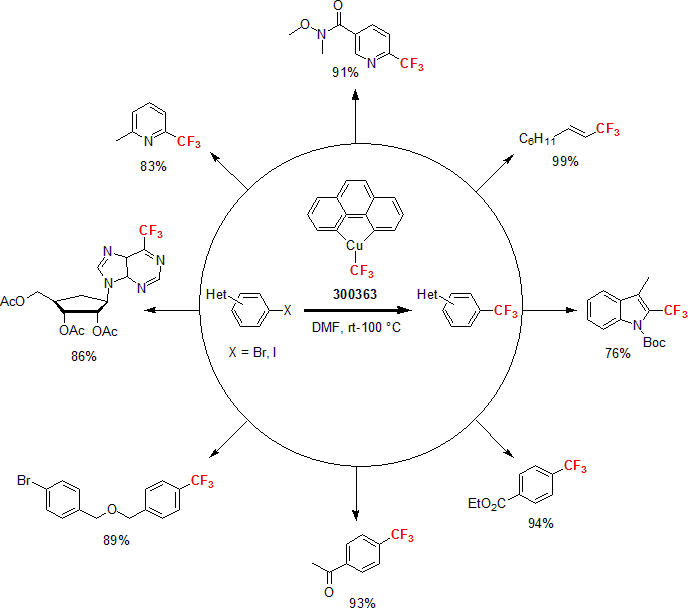 This process provides access to novel difluoromethylated carboxylic acid derivatives and phosphonates in good yields. 1 Zhang, X. et al. Angew. Chem. Int. Ed. 2014, 53, 1669. 1 Hine, J.; Porter, J. J. J. Am. Chem. Soc. 1960, 82, 6178. 2 (a) Stahly, G. P. J. Fluorine Chem. 1989, 43, 53. (b) Prakash, G. K. S. et al. Angew. Chem., Int. Ed. 2003, 42, 5216. (c) Zhu, L. et al. J. Fluorine Chem. 2007, 128, 1098. 3 (a) Sabol, J. S. et al. Tetrahedron Lett. 1992, 33, 3101. (b) Prakash, G. K. S. et al. Eur. J. Org. Chem. 2005, 2218. 4 Prakash, G. K. S. et al. Angew. Chem., Int. Ed. 2004, 43, 5203. 5 (a) Ni, C. et al. Angew. Chem., Int. Ed. 2006, 46, 786. (b) He, Z. et al. Angew. Chem., Int. Ed. 2012, 51, 11545. 6 Zhao, Y. et al. J. Org. Lett. 2010, 12, 1444. 1 Gu, Y. et al. Nature Comm. 2014, 5, 5405. 1	Weng, Z. et al. Angew. Chem. Int. Ed. 2013, 52, 1548. 2	Xu, C. et al. Angew. Chem. Int. Ed. 2014, 53, 9316. 1 Senaweera, S. M.; Weaver, J. D. J. Org. Chem. 2014, 79, 10466. 2 Senaweera, S. M. et al. J. Am. Chem. Soc. 2014, 136, 3002. Click here to see a list of FAYE Blocks. 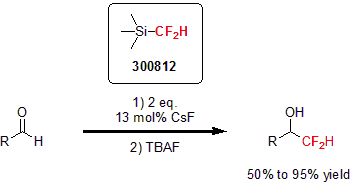 The SF5 moiety has been called the Substituent of the Future because of its enhanced lipophilicity, electronegativity, and metabolic stability. It has been used in several drugs and crop protective agents and showed improved efficacy in a number of cases. Aspira Scientific is pleased to offer a series of SF5 compounds to accelerate your drug and material development programs. Click here to see a list of SF5 Compounds.